The webinar will share the key findings of the State of Business Operations survey by HfS Research in conjunction with KPMG with 829 enterprise buyers, service providers, and advisor/consultants. 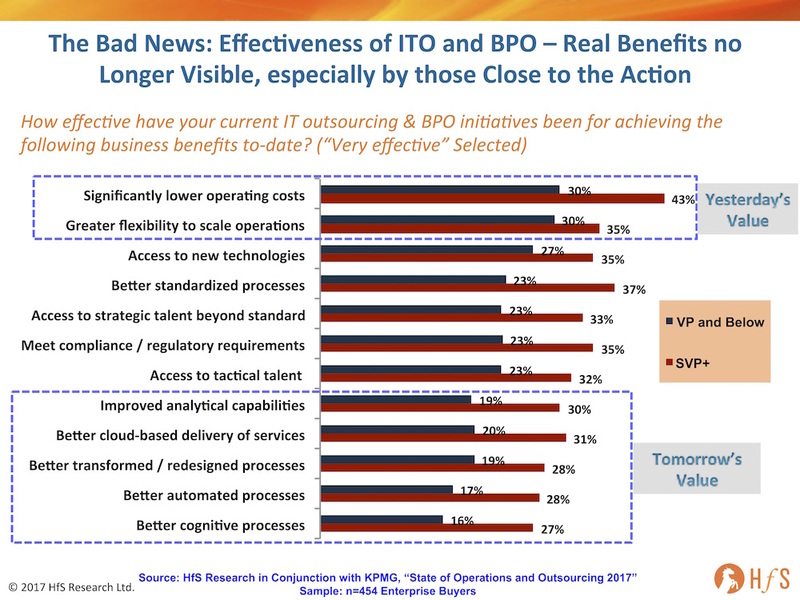 The outsourcing and shared services market has been in a seemingly endless state of flux for as long as HfS Research has existed – with the current market more confused than ever before, organizations struggling to cope with competing priorities, and confusion on the requisite timing and methods to best exploit new(ish) technologies such as process automation and evolving service delivery models. The market study covers the present scenario and growth prospects of the global application lifecycle management market for 2017-2021. The report also lists cloud-based ALM and on-premises ALM as the two major segments based on deployment models. The cloud-based ALM segment accounted for 58% of the market in 2016. ALM helps organizations reduce costs and provide on time services to markets. It also enables the centralized management of project portfolios. Centralization allows organizations to enhance the decision-making process and thereby improve the performance of the organization, eliminate duplication of effort, reduce operating costs, and maintain multiple data centers. These services also help organizations increase their savings, as it gives the IT managers and chief information officers (CIOs) visibility of application cost and associated support that is required to get back the expected ROI. ALM helps organizations to achieve higher productivity by providing end-to-end performance report. ALM helps speed up the development and test cycles, which helps in quicker time to market. The functions in organizations are fully automated and streamlined when ALM software package is used, resulting in rapid designing, delivering, and deploying of the software. “Furthermore, ALM helps to centralize the management, attain real-time visibility into the application delivery process, and implement consistent workflows and processes across the application lifecycle, thereby reducing the duplication of effort between projects,” says Amit. ALM helps monitor business application management services. It provides flexible, integrated, and real-time decision-makingsupport for those in the top management, which, in turn, helps to improve responsiveness across an organization. Diverse elements of multinational environments, such as language, currency, and accounting standards, are covered in a single application management service. The service provides for better analysis and planning capabilities. It enables comprehensive and integrated management of related businesses and corresponding data. This integration allows the complete deployment of various kinds of decision-making support systems and project management functions. Infosys (NYSE: INFY), a global leader in consulting, technology, outsourcing and next-generation services today announced that Gartner, Inc. has positioned Infosys as a ‘Leader’ in its Magic Quadrant for Oracle Application Services in Europe, the Middle East and Africa (EMEA) and North America. The report evaluated 16 vendors in EMEA and 20 in North America for the full-life cycle of Oracle application services, spanning project-based implementations and multiyear application management services (AMS). Gartner analysts evaluated service providers for their ability to deliver a comprehensive set of implementation and management services across the Oracle portfolio of products for EMEA and North American clients. Infosys was positioned highest for its ability to execute in EMEA. An Oracle Cloud Elite partner, Infosys drives innovation and new opportunities for its clients with next-gen digital technologies so they can achieve higher efficiencies and increased customer engagement. As organizations struggle to keep up with the disruptive shifts of digital transformation, service delivery models are evolving fast toward centralization and greater use of automation, according to the HfS/KPMG 2017 State of Outsourcing and Operations. While there is growth across the board in all types of service delivery models, the study found that there is a drive toward full Global Business Services (GBS) and a spectrum-wide move away from decentralized models. For example, 11% of organizations are already operating under a GBS structure, while 20% are moving in that direction with a global shared services/outsourcing model. Only 16% of organizations are functioning under a fully decentralized structure. “Companies are clearly re-examining the ways they go to market with their delivery models, because they must,” says KPMG’s Stan Lepeak, Head, Market Research at KPMG Global Management Consulting —disruptive technology is having such a significant impact on the front, middle and back offices. Organizations realize they need to start functioning with a “One Office” operating model, which hones in on the needs and experiences of the customer central to the entire business operation, while old barriers between corporate operations and functions are eroded and the constraints of legacy IT are limited. With “One Office” operating models such as GBS, organizations can begin to integrate not just the processes but also technology and data sets. 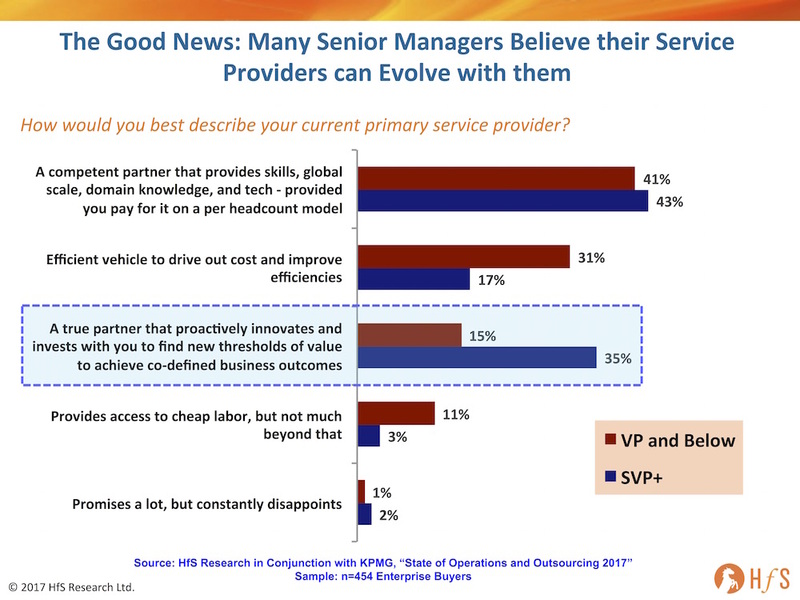 GBS is on the cusp of a major leap toward integrated service delivery models, with lower-value services outsourced and an increasing focus on analytical, judgment and expert services. “In over 300 GBS maturity assessments we’ve done for clients, it’s clear that getting really good at GBS is hard — especially if you have complicated, global, diverse underlying IT systems,” says Lepeak. “We see many organizations make some early progress towards greater GBS maturity but then often hit a wall. Robotics process automation (RPA), he explains, is a great opportunity for firms to move toward GBS maturity — so they don’t have to have as many locations, for example. “This is going to be key and ultimately change what GBS operations look like,” he says. Two years ago, the State of Outsourcing and Operations study found that clients were increasing investments in offshore use for outsourcing — Finance & Accounting was poised to rise 22%, for example, while HR was predicted to rise by 13% and IT/network infrastructure support by 23%. Today, however, there is a much flatter outlook in all of those areas. Finance & Accounting, in fact is predicted to decrease by 4% and HR by 3%. 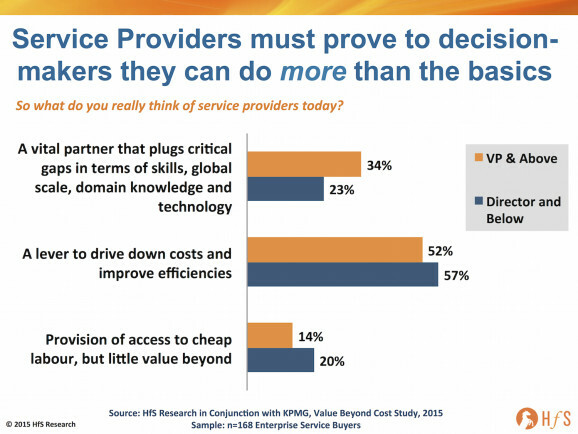 There were similar results in offshore use for shared services. As a result, companies are starting to look at their offshore strategies and decide whether they need to go forward with those efforts. “The confidence level in RPA has increased; it’s not just about hype anymore,” says Brown. The bottom line? According to the State of Outsourcing and Operations 2017, there’s no doubt that the shared services and outsourcing industry is on the cusp of massive change as the entire outlook of operations — from the front-office to the back — evolves into a centralized, “One Office” model. But this is not about jobs going away. Instead, it is about a reevaluation of the nature of work. Organizations must begin to embrace the digital and intelligent automation tools available and write off legacy options. The future of the industry demands it.